One of my all-time favorite salads is the ‘Asian Sesame Chicken’ from Panera Bread. It’s filling, healthy and not a huge splurge when it comes to counting my daily Weight Watchers points. It’s also a salad I’ve tried recreating at home in the past. And while surfing sites the other night, I was lucky enough to come across the recipe from the original creators. With this post, though, I’ve added a few ingredients so that the end result has a nuttier taste. I could seriously drink this dressing by the glassful, it’s that good. So, when I was generously given the opportunity to test drive one of OXO’s newest products (the fab Salad Dressing Shaker seen above), I knew this was the perfect dressing to start with. And the best part about it, is the ease of use. 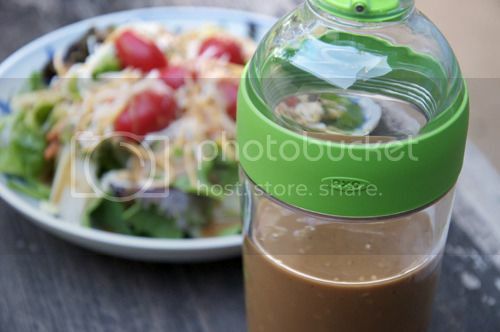 Prepare, serve and store all in the same sleek bottle… it goes from fridge to table and is even dishwasher-friendly! The wide opening accommodates a range of ingredients and the airtight, watertight and leakproof seal accompanies a one-handed open/close lever that easily flips back to pour. Contest is open to U.S. residents only until Wednesday, June 20th, 2012 at 11:59 pm CST. One winner will be randomly chosen by random.org and announced by Friday, June 22nd. Pour all ingredients into a shaker and combine. Break up the mixture with a fork or small whisk, if needed. If you're without a shaker, combine all ingredients except canola oil in a medium mixing bowl with a wire whisk. Once ingredients are combined, slowly pour in the oil while whisking to form an emulsion. Disclosure: I received two Salad Dressing Shakers from OXO for purposes of a review (one to keep and one to giveaway). All photography and opinions are my own. 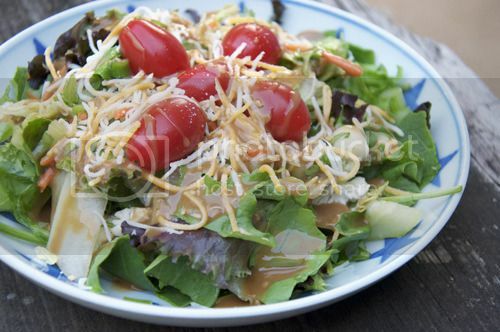 I love the Asian sesame salad at Panera, so I’m going to try this recipe to recreate it at home! This is probably my favorite salad dressing ever…I can’t explain how happy I am you posted the recipe!! Great giveaway, too!! I am currently following Weight Watchers points and I just love the program, I find it easy to keep up with and it really works. I had no what to eat at Panera Bread and we are going there this weekend. Now salads are one of my top choices. I would love one of these. I’m trying to be good but all of these cookouts mean yummy but not so healthy food. I try to bring a salad of my own and would love to bring it in something where I can limit the proportions, etc. ! Oh! I liked OXO on FB, can’t believe I haven’t done it sooner since I love their stuff! This dressing looks great! I can’t wait to try it. My favorite is cilantro-lime vinaigrette! I can’t believe that I haven’t tried this salad at Panera yet…next time, for sure, I will!! I’d make a lemon vinaigrette dressing. I follow OXO as @carlyhobart. I think I would make this dressing! I follow OXO on twitter. What a pretty dressing shaker! I love any and all vinaigrettes. Dressing is so easy to make at home yourself so having this around will make it even more of a cinch! 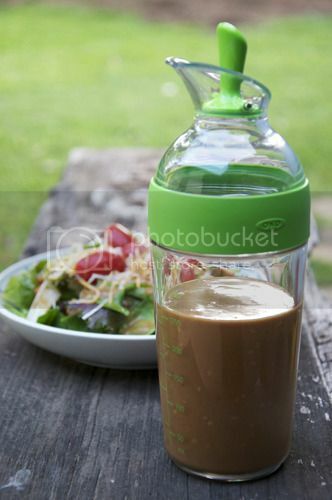 Love the shaker idea! This would be good for MORE than just salad dressing!!! this is erfect for the summer months! I’d love to try your Asian Ginger Sesame dressing, sounds yummy! I just got back from visiting my sister in North Carolina. She made a delicious vinaigrette while I was there and she sent me the recipe. I haven’t tried to make it yet but I will. I’d like to make ranch dressing or balsamic vinaigrette. howdy – i would make lemon mustard seed dressing! The only dressing I have ever made is ranch… maybe I should be crazy and try something for once! I’d start by making a great basic balsamic vinagrette! Truthfully, after seeing this, the only dressing I want right now is this one! Yum, I just added this dressing to my ziplist! Plus, what a cool dressing maker. Great blog post and giveaway! I like the Balsamic Vinagrette this would be great to make. I Liked OXO on Face Book. Previous post: Keep It Cool with Daily’s Cocktails!